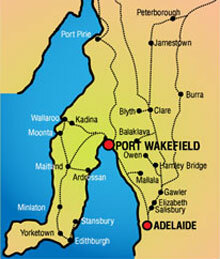 Port Wakefield is a progressive coastal town of the Adelaide Plains. The town is located approximately 100 Kilometres North of Adelaide, South Australia. It is serviced by a dual lane highway which passes through the Eastern edge of the town. It is seen as a major transportation corridor for both commercial and domestic travellers and provides numerous services to support such an industry. The town itself is a hidden treasure. Little do people realise that a few hundred metres West of the transport corridor, there is a township steeped in colonial history that sits on the coast of the upper reaches of Gulf St Vincent. It was a town created to cater for the needs of the early settlers. With the development of the agricultural, mining and later the fishing industries of South Australia, Port Wakefield became the pivot point for such products. A port was developed to cater for the increased production of such commodities as ore from the mines at Burra, hay and wheat from the farmers both locally and surrounding districts. The town grew steadily and thrived on the emerging industries until the introduction of the railway system. Port Wakefield is developing as a tourist destination with its easy access to Gulf St Vincent for fishing and water activities. It has a modern boat ramp, Tidal swimming hole, cool coastal breezes, access to Clinton National Park, Samphire Coastal areas, tidal flats teeming with mangroves and wildlife, Nature walks and numerous coastal birds and a Heritage Courthouse Museum. It is also the stepping stone into other popular tourist destinations. It is an easy drive of no more than 1 to 1 ½ hours to tourist destinations such as the Clare Valley, Copper Coast and the Yorke Peninsula. The town (and surrounding areas) also has numerous industries developing. Major developments in recent years have included the Pork Industry with intensive farming and meat processing, poultry farms, Hay processing and exporting plants, An Intermodal Transport Hub, Quarry mines, and numerous housing developments. There is also a proposed Marina Development which has received State Government Major Project Status. With these economic indicators the town is on the verge of economic and population boom – watch this space.